Bret Bonaparte, 1st Level Fighter. Zeus Sunderstorm, 1st Level Fighter. • After a night's rest, these hearty adventurers were the ones who had decided to take up Verilous the Wise's job offer of finding the Idol of Perrin form Bludenhare's Mine for the reward of 40 Gold per person. They struck out just after sunrise and came upon the Mine by midday. • Zeus read the dwarven runes of warning placed on the huge doors leading to the Mine aloud, to his comrades. They pushed them open and mad their way into the vast entrance way. The air was stale and it took a few minutes for them to be able to adjust to the foul smell filling their noses. While the stonework of the Mine was not finished to the exacting standards of dwarves, it was still impressive. A heavy layer of dust coated the entire room and the group seemed certain that no one had been here in hundreds of years. The found a Shrine to Moradin, with quite a bit of coins left in the offering bowl, but resisted the temptation to steal any of it. • As they entered the hallway before them, they found 2 sacks of ancient grain. Zeus immediately noticed an large amount of ash under and around the sacks, but obscured by the heavy dust. • They chose to move off to the right and enter a room with finely worked iron double doors, inlaid with offerings to Moradin. Inside was a forge, complete with finished arms and shields and work table piled high with works in progress, a cot sat lonely off to the far left. Dust had taken over her as well. All of the weapons were masterwork and Mars selected 2 hand axes to keep, while Bret and Zeus both helped themselves to shields. Across the room from the entrance was a matching exit and they carefully decided to continue. • The Forge opened into a hallway with no discernable markings, but all of the stonework here was covered in ash, it continued this way evan at the hall turned right and left. The only area not covered in ash was spot to the left that dead ended at a wall. 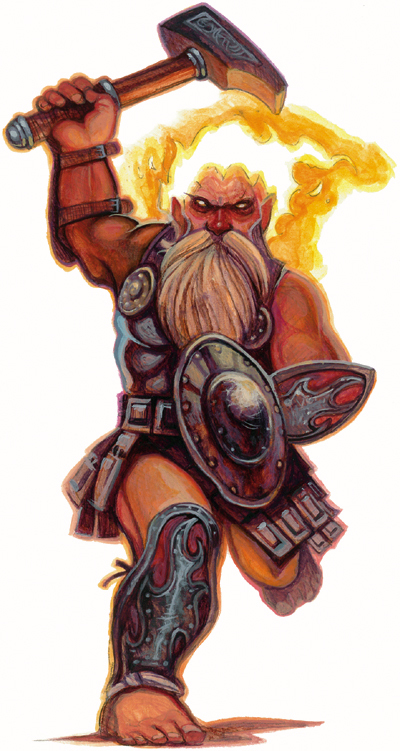 Zeus inspected the wall and found a trigger mechanism which dropped him 20 feet onto 4 dwarven skeleton in a pit trap. As he groaned from the fall he found both a Holy Symbol of Moradin and a Prayer Book to Moradin. Mars spied a similar trigger, inches from the one that Zeus had found, and Brett used his longsword to reach over the pit trap and flip it. The dead end opened to reveal a secret room. Gronk helped Zeus out of the trap and Zeus and Esme hurried into the small room. • Inside lay the bones of dwarven priest, clutching a gem encrusted warhammer to his chest that somehow resisted the heavy dust all around them. Zeus found a scroll at his feet and read it. "We cannot stop them and we looked in the wrong places. The dark places. We were fools! Now the whole world may pay for it. We cannot let them get the Warden's Hammer. Jarl, forgive our folley." was it's warning. Esme noticed the bones of dead dog to the right of the priest and found the Idol of Perrin laying inside it's ribcag, and snatched it up. And Zeus stashed the Hammer in his things. • Before she could alert her comrades, the earth began to tremble and temperature quickly rose close to 29 degrees. The group began to run back the way they came, when a Fire Elemental burst forth to block their way. • Each member of the group tried their best to extinguish the living inferno before them, to little avail. And the battle was joined from the right by 2 Azer warriors. One of the warriors was quickly dispatched by Esme and Praxis, while the remainder of the group finally banished the FIre Elemental. The ground began trembling again and the remaining Azer offered his surrender and laid down his arms. • The newfound comrades now had a decision to make and little time to decide.